One fact most people can guess about alcoholism and alcohol abuse is that they have long been the primary sources of addiction affecting tens of millions of people in North America. Ethanol, the intoxicating ingredient found in beer, wine and liquor impacts the central nervous system as a depressant. It affects memory, coordination and behavior while often lowering inhibitions and leading to high risk behaviors. 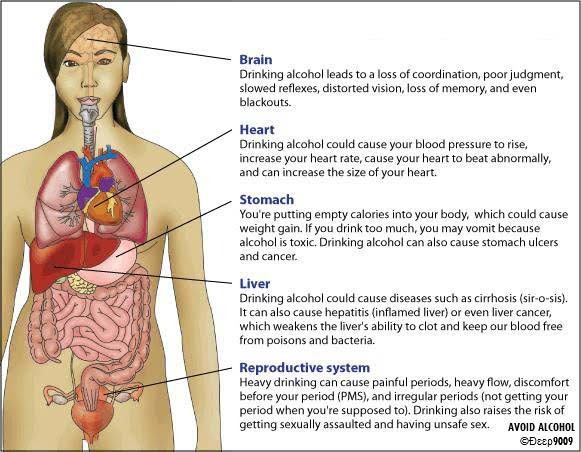 Alcohol affects every organ in the drinker’s body. Heart and liver problems are among the most serious, although the increased risk of cancer, diabetes and stroke are well known. Drinking and driving continues to be a large and serious problem leading to thousands of deaths and injuries each year. The only way to decrease these numbers is to educate the public about alcoholism and alcohol abuse and provide help for alcoholics. Addiction to alcohol occurs among 15% – 20% of those who drink. Research suggests that the risk increases when alcohol is used at a young age when the brain is still developing. In combination with many drugs, alcohol can be fatal. Alcoholism and alcohol abuse can affect the body at any age. Binge drinking by teenagers and young adults has led to a dramatic increase in alcohol poisoning. High-risk behavior is associated with alcoholism and alcohol abuse, resulting in DUIs, arrests for inappropriate behavior and spousal violence. If you or a friend are experiencing such behavior, call us now to inquire about help for alcoholics.